Today I have a yummy recipe for you of a "Iced Cinnamon Roll Coffee Cake". It's very simple and easy to make and its so delicious! Add these delicious coffee cakes to your bread basket. 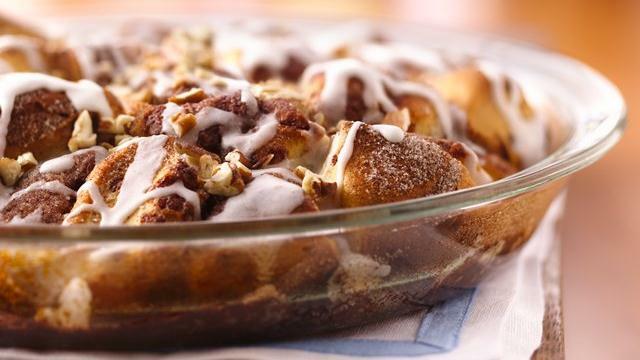 Spread Pillsbury® Cinnamon Rolls over nuts and top with icing - a baked delight. Heat oven to 375°F. Using 1 tablespoon of the butter, butter 9-inch pie pan. Combine sugar and cinnamon; sprinkle 2 tablespoons of the mixture over buttered pan. Sprinkle 3 tablespoons of the nuts over sugar mixture. Separate dough into 8 rolls; cut each into quarters. Place half of pieces evenly over nuts; sprinkle with 1 tablespoon of the sugar mixture. Dot with remaining tablespoon butter; top with remaining roll pieces and sugar mixture. Bake at 375°F. for 18 to 20 minutes or until golden brown. Drizzle icing over rolls; sprinkle with remaining nuts. Cut into wedges. Serve warm.